Even though I’m running one of the Dream Theater fan clubs, I’m far from the one who has seen the most Dream Theater concerts. But when it comes to seeing them perform in different parts of the world I think I’m doing pretty good. My latest gig was no exception. Moscow, Russia. Its always very interesting to see what the band offers the different crowds and how they adapt to the different settings. Whether it’s a festival or an evening with or playing for a European, American or Asian crowd. Having never been to Russia before I was excited to see how the crowd would respond compared to crowds in other parts of the world. The Italians like singing their heads off while some other crowds like to sit back and watch. If it’s a festival chances are greater that the crowd will be wild and energetic than if its an evening with. The venue in Moscow this time was Crocus City Hall. A relatively new venue situated on the outskirts of Moscow. A location some artists have had difficulty getting to in time due to the infamous Moscow traffic jam. Arriving by metro however is a breeze, efficient and reliable. The venue is part of a huge exhibition center and can accommodate around 6200 spectators. Tonight Id say the venue was about half full so maybe around 3000 fans, eager to see Dream Theater perform. Doors opened 6:30pm and the doors to the actual concert hall opened at 7pm. Pretty standard timings for a show such as this one. Soundcheck got a little delayed due to some technical difficulties at the venue. The band actually had to continue their soundcheck after the outer doors were opened but made sure to keep the sound down not to give away anything for the waiting fans. However some of the songs played at the soundcheck were not included on the setlist for the night. I was fortunate to see the setlist before the gig and to be honest I was a little reserved about the combination of songs and how they would work together live. But man was I wrong! At 8:30pm the lights were turned off and it was showtime! The introtrack chosen for this tour is from the movie Inception starring Leonardo DeCaprio. Dream Is Collapsing is composed by Hans Zimmer and is a really cool track to get the crowds anticipation up and energy going. In the dark the band entered the stage and John Petrucci starts off the first song of the night, Under a Glass Moon! What a start! I cant remember the last time that being their first song for the night. I might be wrong but it must be over 10 years ago! Now, I had off course seen the setlists from the previous show on this tour so I wasn’t totally surprise by tonight’s song selection but I was surprised of how well the songs worked together. Needless to say Under a Glass Moon set the standard for the rest of the night and certainly got the crowd going. The Russian crowd was quite similar to the crowds I’ve seen in Norway. There’s a core of fans front center that go nuts all night while the rest needs a little bit of encouragement. But with the new situation with the band, James stepped up and was more of a front man than before. He made sure to keep the crowd going and hands up in the air. And while I’m on that topic, the band really seemed like a tight band, mutually respecting each other and being on the same page. Interacting and smiling in a way that I haven’t seen in many years. And “the new guy” was to get his introduction later in the evening. I know a lot of people have been skeptical to a Dream Theater without Mike Portnoy but with tonight’s performance I believe that even the skeptics will finally let that thought go. Mangini fits in perfectly with the band and it was really cool to see how the bandmembers interacted with Mangini throughout the night. Nothing but smiles from start to finish. And when the band is having fun, the fans get a show to remember. Don’t get me wrong, I think Portnoy is a brilliant artist but sometimes changes aren’t necessarily a bad thing. Next song up, These Walls. I don’t know why but These Walls really rocked in a way I haven’t heard or seen live before. I literally got goose bumps! From the first note to the last everything was perfect! I only wish the show had been filmed, because this certainly was a live highlight! The visual effects seemed to have been downscaled abit though. It might have been the huge stage that made the big screen seem tiny but the visual effects on previous tour made a bigger impression than tonight’s. Having said that, the light was never really all the way down in the venue so that the light and video didn’t come to its full effect. Too bad because Johnny Video (nickname of the visual effects tech) did an amazing job. Third song of the night was Forsaken. Great song and great for sing along. Something the Moscow fans certainly did. I could recognize the video footage shown on the big screen from previous tours but there was also some new stuff there. But mostly the footage from the official Forsaken video was shown. By now it was no doubt that the band is still among the best live performers in the world. And in their genre they are the undisputed masters! Endless Sacrifice was no exception. Being one of the longer songs of the night the band still made sure to keep the crowd on their toes by hitting every note perfectly. It must be said that Mangingi has only practiced to the album version of the songs so for those of you who expect the same live interpretation as Portnoy you will be disappointed. Well, in fact disappointed isn’t the correct word to describe it because Mangini ads a new fresh feel to the song but at the same time he stays true to the original song. A few new fills here and there makes the songs seem fresh and updated so to speak. And over the next few minutes Mangini got the chance to prove once and for all the he is the man for the job. A 5 minute long drum solo that completely blow everyone’s mind away! The man is a beast! The good kind! The kind that says “I love what I’m doing and I’m gonna play your boots off!” Manginis drum kit is somewhat untraditional not having the usual left to right, light to big tom setup. With the smallest tom in the middle, surrounded by a snare on top and below with bigger toms on the side, Mangini has a kit that enables him to play in a way that seems unusual even though the sound itself isn’t unique. His kit looks symmetrical but the right side has toms a notch larger than the left side. The cymbals also vary as you would expect from small splashes to a big gong with everything in between. And as the solo showed, he knows how to use it all. For a good 5 minutes Mangini just went totally nuts behind his kit and made all the jaws in the room drop to the floor and when it all lead into Ytse Jam the night was perfect before we were even halfway! I think its great to see the drumsolos back in the setlist because lets face it, a lot of the fans are drummers who’d love to see their new favorite drummer create a local earthquake on front of their eyes! Ytse Jam was as perfect as could be. Mangini totally nailed it and no one expected anything less from the world’s fastest drummer. If I had to put my finger on something I’d like to hear the bass drums a little clearer. Jordan could also benefit from a little louder sound. Other than that the mix was really good. I tried to move around a bit in the venue to see if there was a big difference in the sound from place to place and the sound varied a lot. In front of the control board, as you would expect the sound was perfect but under the galleries the sound wasn’t that great. I wonder why people in the back rows didn’t go down to the floor because it was only three quarters full and the sound was a lot better there. And of course the energy on the floor always beat the back rows. The Russian crowd was also a very polite crowd. If you wanted to squeeze through to the front no one would be upset or tell you to piss off like you could expect in some other countries. Actually almost everyone that I observed on the floor made sure that they weren’t blocking anyone’s view if they moved to a new spot. Hats off to the Russian fans! Next song was Peruvian Skies. I song that personally has never been a favorite of mine but like the rest of the setlist Peruvian Skies totally worked and it was especially nice to see how the band enjoyed the song. Like when Petrucci laid down some very cool bluesy fills between the verses to James amusement. Now, for those of you who have been paying attention you would by now notice that none of the songs so far have lyrics written by Mike Portnoy. This of course feeding the conspiracy theories. But like the band says, it is a coincidence. And we have no reason to believe otherwise, so just let it go people! The setlist works and lets leave it at that! Now, the following song is a favorite of mine. Goosebumps again! The Great Debate! Everything about that song just works in every level possible. The intro with double hihats, the build-up, the lyrics, the middle section, the solos, the outro. And needless to say, they nailed every part! By now Jordan had played on his latest addition to his keyboard world a few times; The iPad 2 with a special edition of Jordan’s own Morphwiz application. The app Jordan uses has less menus and more playing surface compared to the normal version available on iTunes Appstore. The iPad is mounted right below his keyboard camera so you can see clearly what’s played on the big screen. The Korg Kronos keyboard does not have a camera mount on the side so the camera is mounted on the right side of the note stand giving a view from above of the keys. This camera is only one of several that Johnny Video can choose from during a show. There are two cameras covering Myung and Pertrucci and two covering the drum kit; one above and one at the front facing Mangini. If you payed close attention you could from this camera see that one of the tom-mics came loose during the show but Mangini was able to secure it while continuing to play! The only song from the upcoming album was the newly released single On the Backs of Angels. A great tune with a feel of the early years of Dream Theater. I love James mellow voice in this song and I really like the lyrics. Once again the conspiracy theories are many as to what the lyrics mean but once again, let it go people and enjoy the music instead! The Moscow crowd sure did! Even though the song has only been out a few weeks most fans seem to know the song and most of the lyrics. Most of the video effects were new as you would expect but as mentioned before, the stage was so big that one big screen didn’t seem enough. Three would have done the trick! If On the Backs of Angels set the standard for the upcoming album A Dramatic Turn of Events then we certainly have something to look forward to! The date for the Moscow show was July 12th. John Petruccis birthday! I must admit I was hoping for a cakefight on stage but instead the band and crowd sang Happy Birthday to John with Jordan on the keys. After that the roof lifted! 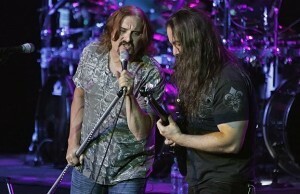 Caught In a Web with James LaBrie at his best! This classic Dream Theater song from the Awake album is a favorite among old and new Dream Theater fans. The crowd went nuts with their headbanging, air guitar, air drumming and singing! James really showed who’s the boss and who’s the leading metal vocalist in the world. After almost ruining his vocal chords in the mid nineties it is remarkable that he is still able to hit the high notes the way he does. Name one other vocalist in the same genre that can do the same! I can think of none! Awesome job by the band. The two next songs were from the Scenes From a Memory album. Through My Words and Fatal Tragedy. James once again displays great control over his voice and held the songs together while Pertucci and Rudess embarked on probably one of the most challenging instrumental sections in their catalogue. And even though Mangini is one of the best drummers in the world I wouldn’t have been surprised if he missed note or two. But did he? No! Perfection! Scenes From a Memory being a fan favorite its needless to says they were all smiles by now. The band make the shrink-and-grow section of Fatal Tragedy seem so easy but trust me its not! I asked Pertucci in an interview earlier this year if he was afraid the all his weightlifting would slow down his speed in his playing but Fatal Tragedy was a proof of what he said; “No, it doesn’t slow me down”. Last song before the encore was The Count of Tuscany. Beautiful intro and a beautiful live performance. I love this traditional Dream Theater tune and especially the part after the solos when its only Petrucci and his “acoustic” guitar. His sound during this part was amazing, very clean and basic. I love when the raw instrument sound comes out and its not overproduced with effects and sounds. (I know its Johns electric guitar with acoustic/clean sound but still). After a quick thank you the band left the stage but everyone in the venue knew there was more to come. And tonight the crowd was blessed with one of the most popular Dream Theater tunes of all times. Learning to Live. Only played once earlier this tour (Rome) the Moscow fans knew to appreciate this somewhat rare performance. Learning to Live have over the past decade mostly been played as part of a medley so it was a perfect way to end an amazing evening. After the last note the band did their usual bow and left the stage. A brilliant setlist from start to finish performed by a band at their best. With the enthusiasm they showed tonight, there is not stopping them and I think we’ve only seen half of what they can achieve! Am I even more excited about the new album? Yes I am! So should you! In the meanwhile, Dream Theater is playing in selected cities through out Europe so get up from your couch and see them live because this Dramatic Turn of Event might just be one for the better! Thank you for a brilliant review! Tis like I’ve been there one more time 😉 Every little detail is noticed! Great! Hats off to you!